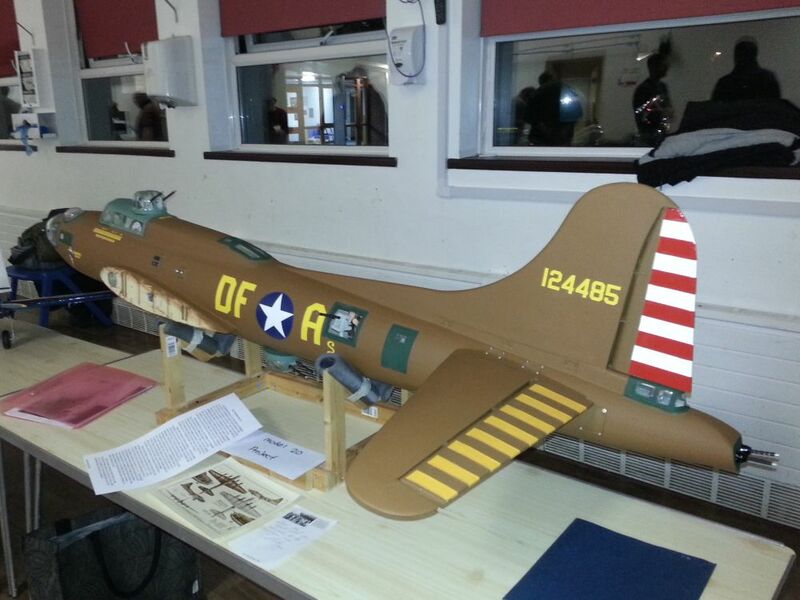 I am helping out another club member with a B17 that a late club member built and nearly finished. Big question…any idea if there were any other B17 104 inch models available running 4 x SC52's. There is of course a chance that he had it re-scaled but the ribs I can see are laser cut as they have ID number on them. Any suggestions warmly welcomed as to where I can get a set of plans and a couple of cowls. Aerotech used to do a 1/12 (104" span) scale B-17 kit, but it was a while ago. It was obtained from the USA if that's any help. Mick E had quite a lot to do with this model - have you asked him? Try searching for 12th scale or 103". It was built from a (laser?) cut part kit. I obtained a set of Aerotech plans....see my OP as its not at all close to that....I suppose Brian might have changed the wing material, flaps, wing to fuselage mount and main spar design, but it would seem a lot of effort unless Aerotech made two versions with the same wingspan model? Rib numbering is different, could have been a resized and laser cut, but then I don't know if he used the plastic parts on the fuselage. Two of the cowls are the right size! I would love to know if it flies. I helped out with some of the changes he made but I do not recall if he made the changes to a split wing, I know we did discuss this when he was in the planning stage and we both thought that split wing was the way to go purely to make it easier for him and Carol to handle. I know we did look at the possibility of a Royal B 17 kit and I think I tried to steer him away from this as he had a tendancy to build heavy. But there has been a lot of water under my keel since then and my memory may be playing tricks. Thanks for the information as even the odd snippet of information is useful. Martin suggested I talk to Mick as he assisted Brian as well. I was surprised at how light the wings felt with a pair of 52's in them compared with my IC Seagull Mosquito, 3kg compared to 2.7 kg and its 20 inch less wingspan. Although I don't know the fuselage might come out as it could be on the heavy side! I can see the logic as the Aerotech looks a one piece wing and must be a real issue transporting it about at 104 inches if the had gone for that. Can you remember when Brian started the B17? We get Brian's Vulcan flying on special occasions and that has marginal power and high wing loading, but its just great watching it take up the sky as Dave hauls it around for another Farnborough pass! 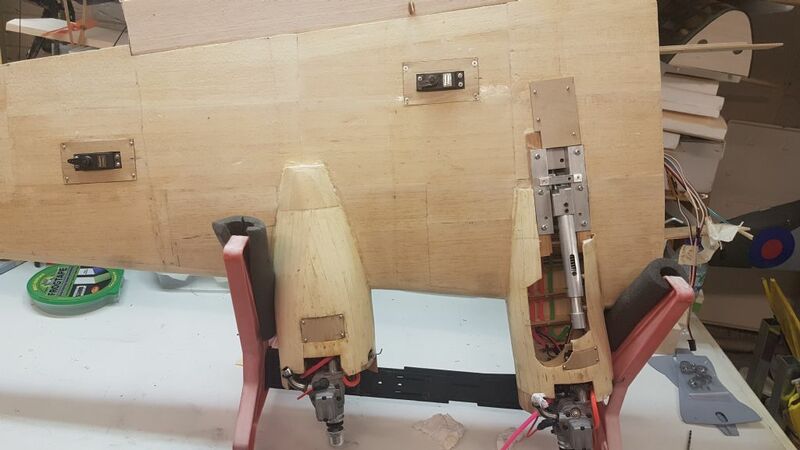 As you can see hopefully there is not that much left to do in 11 weeks if I get a move on as the fuselage is apparently complete its just finish off the wings! My scratch built, (no plans), 100" span, foam core wing covered in brown paper, the rest is balsa. Plug in wings, and horizontal stabs for easy transport. Electric power. The video was shot when she still had brushed motors, Olympus belt drives, and Nimh cells. She was eventually upgraded to brushless and Lipo, and shaved 2Lbs of the weight. Current flying weight is 10Lbs - 2oz, Still fly her occasionally. This is any good ? Thanks cymaz, looking at some of their build photos it looks the closest so far although I am not to sure they would do a special 12th scale version with the cowls etc. I'll see if Mick's about at the weekend...not likely to be much flying! 2005 would be about right for a start date. When I last saw him at his workshop he had both wings complete and we did a trial fit of the joiners and that would be the summer of 2007. I am glad the Vulcan is still flying. It was marginal off grass but once airborne flew very nicely. Did Mick get his Hunter flying? I am blown away by the performance of these lecky fans. JD, Thanks for the info, hadn't realised he had been at it that long with the B17, still have some time with my DC3 then! The Vulcan I have (Brian's) is twin electric pusher as he had a IC prior to that. Marginal is an understatement as it takes 20 yards of bungee at over 50 lbs of pull to get it into the sky and about four major rebuilds to iron out the issues. I understand the Hunter went in on its maiden, not sure the cause as I was not there. Build light. they fly much better. Sorry the video is so poor, I forgot to check and clean the lens. 82" span, 8Lb - 15oz flying, under 600 watts total. Progress is almost completely good news, regarding missing bits etc. A club member had the missing cowls and better still Brian has detailed the Starboard inner cowl (no3) so that makes life easier. I have obtained the glass sheet to finish + 2 of the 4 silencers. Found a photo of the fuselage from a couple of years back (I haven't seen it since) but it looked good then. Only sticking point at the moment is getting hold of four sets of Robart U/C air line quick connectors (white) that seem to be out of stock in the UK. It will have dual battery, dual switches or switch with fail over. Now my mosquito I have engines and gear (mech with servos) set up on separate channels as it makes life easy adjusting each if necessary. Now someone mentioned using two 6 channel RX's, but I can't see the benefit unless to use two TX's (and have a helper). Keep it simple. The more complicated you make it the more likely something is to go wrong. Although the model is big its not heavily loaded and will basically just float about. it is only as complicated as you make it. I had an ESM Hercules of 100 inch and it had one rx, one battery (a good one), one switch and then y leads to the dual elevator, aileron, flap servos. Throttles were done with y leads into y leads. Each throttle was as close to mechanically identical as possible but i didnt loose sleep over it. On a 4 engine model the effects of one engine running slow/fast are not as big as on a twin. Indeed i lost one on the herc once and didnt even notice until i did a flyby. In the instructions for the herc it recommended to set up the throttles on two channels so the inner and outer engines could be controlled individually. The theory was that if one engine stopped you would kill its best mate. This struck me as daft as you are turning the loss of one engine into the loss of two. If another drops you are really screwed! The only time i would consider killing the engines on a 4 engine model it would be if i lost two engines on one side. I would try and keep it flying, but i would be prepared to cut it. If you do use dual rx's make sure the throttles are on a different rx to the rudder. The reason for this is that if you throttle rx drops and you have to wait for it to run out of fuel you can guarantee one engine will keep going longer than all of the others. In this case you will need rudder control to keep it pointing the right way. Equally, if you have throttle control rudder is less of a concern. If either Rx fails you still have throttle on 2 engines, plus one half of ailerons, and one half of elevator. Rudder, gear, or flaps, either work or don’t depending on which Rx fails. I see your logic and agree with keeping it simple. 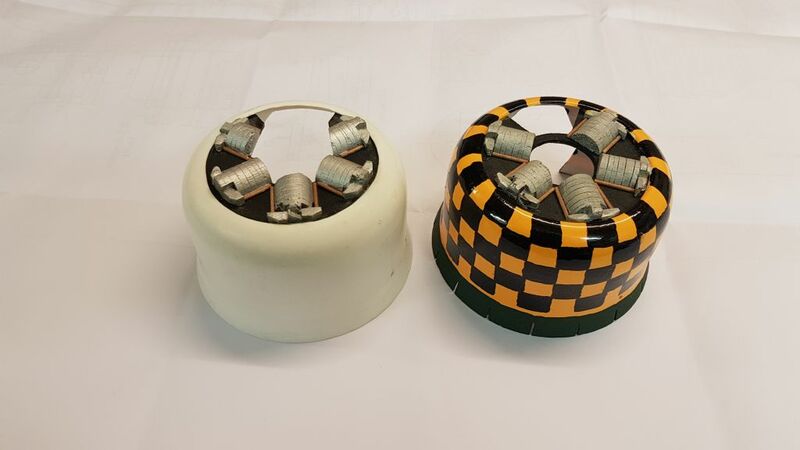 The Dual Ace has two batteries and a single fail over switch, the mossie single battery and no switch (as its easy to open the canopy to connect) and the hurricane single battery. All only have one RX. Sounds like one good size RX battery with switch (of darn good size), one RX and keep it simple. Struggling to see the benefit of only two throttle channels for setting up as either 4 channels would help (but don't have that many free) or a Y and a Y as a little unbalance does not seem to be an issue. I'll knock a drawing up see how things go down. PS Quite like the Hurricane power box arrangement as it has a fail safe switch.